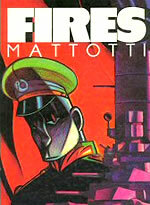 Lorenzo Mattotti revolutionised comics in 1986 with his visionary album Fires, setting the medium ablaze with possibility and poetry. Today, twenty-five years later, he has become an artist’s artist, one of the world’s most mesmerising illustrators, from children’s books to fashion magazines, from The New Yorker to Le Monde, and an Eisner Award-winning graphic novelist for his 2003 adaptation of Dr Jekyll & Mr Hyde. 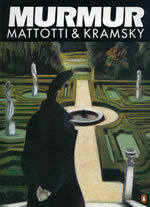 Mattotti takes his inspirations from many sources, from painters, writers, film-makers, musicians, to enrich every project. He has also worked with animation, contributing a moody chiller to the 2007 French horror anthology film Fear[s] Of The Dark. This year brings the English translations of both his electrifying passion-play Stigmata, adapted into a live-action movie in Spain, and his remarkable collaboration with Lou Reed. Born in Brescia, Northern Italy, Mattotti has lived in Paris for the past twelve years with his wife Rina, who runs Galerie Martel specialising in original comic art. 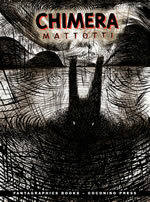 While in London in March 2011, Mattotti took part in a Comica Conversation with his great admirer, Dave McKean. I gather you began by studying architecture? That was by chance. I wanted to study in Venice. I always liked to draw but there were no schools for comics then. I was sure they wouldn’t take me into fine art school where they were teaching mainly conceptual art. Architecture was a good choice in the end, as it gave me gave me a method to not just draw the story but to deal with space, its organisation and composition. My first comics were very grotesque and comical and came from caricature, but thanks to architecture, little by little I went for more realistic and painterly images. My characters became moving shapes living in the landscapes and the atmosphere, the changes of light and colour, give more subtle expression to them than theatrical faces and gestures. They became portraits of their interior feelings. What was your first break into comics? I started by making underground stories about young people and music, very influenced by Robert Crumb, but it was hard to find publishers. So in 1977 a small publisher offered me the chance of a book, but said I had to make an adaptation of a classic. I wanted to make Kidnapped by Stevenson, but Hugo Pratt had done it before, so as a trade-off I chose Huckleberry Finn. I used the classic structure of the comics, it was a sort of graduation piece to show I can do classical adventure in black and white. After this came the adventure of Valvoline, a collective of authors who met in the late Seventies and wanted to reinvigorate comics in Italy, in the magazine Alter Alter. I made Il Signor Spartaco in coloured pencils in a very Russian Constructivist style. And then from 1982 to 1984 I worked on Fires. I remember I found Fires in the US and it knocked me out. It seemed to come out of nowhere. It felt like music to me, the feel was as close to music as you could get, the flow, rhythm, the pastoral nature of it. For me music is very important. I started by constructing Fires without words, using the rhythms of colours to match changes in the story. By the end, the red becomes very strong. Afterwards, I decided to put texts onto the pictures and some magic relationships started, a sort of poetry like in the Tarkowsky films Mirror or Stalker, where a poetic voice speaks over images of nature. It was fantastic, it touches the soul. I was also influenced by Stevenson, Joseph Conrad’s Heart of Darkness and Apocalypse Now, as well as my love of the directors Tarkowsky and Herzog. They gave me the fascination to narrate a story with light, nature, silence, atmosphere, elements of nature, all relating to the characters’ state of mind. I found it’s possble to put wind, fire and silence into a comics story. 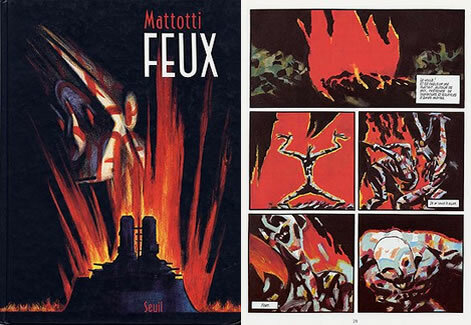 I was also very influenced by comic artists before me like Alberto Breccia, José Muñoz, Dino Battaglia and Hugo Pratt. When I was 14, I first saw very silent pages of Pratt’s Corto Maltese in the Ballad of the Salty Sea, it was revolutionary to me that comics could contain silence. What did you use to draw Fires? On the first pages, I couldn’t convey the natural world with colour pencils, so I started to try oil pastels like the Impressionist painters, Vallotton and Bonnard. In the story, a battleship arrives at in island where something strange is happening, When the sailors arrive on the island, they find the magic of mature and the main character falls in love with this atmpshere. So somehow I had to convey his emotions with this technique. I did not know how to control it, but I decided to go on. I find very often the best work people do is when they’re not really sure what they are doing. They can just get a glimpse of something and aim towards it. After that they know and maybe they get better at it, but they never recapture that edgy magic. Yes, Fires is also the story of my exploration of techniques. Little by little the marks take over and make the images. The battleship and the sailors are always very strongly drawn, military, like Russian constructivism, while the hero dissolves into nature. You have made illustrations for several literary texts, such as Collodi’s Pinocchio and Dante’s Divine Comedy. 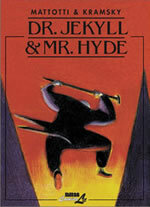 How did you approach adapting Stevenson’s Jekyll and Hyde into comics? I wanted to make my own version, more free, not so constricted, so with my childhood friend, the writer Jerry Kramsky, we decided to take the story out from Victorian London and put it into a German setting during the Weimar Republic with the rise of the Nazis, and the Expressionist painters like Otto Dix, Max Beckman, George Grosz. 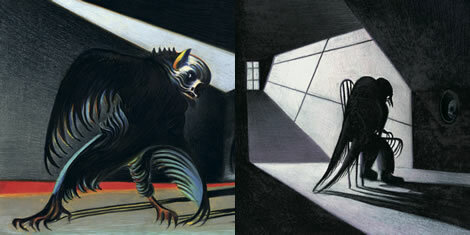 Beckman’s self-portraits look like Mr. Hyde. 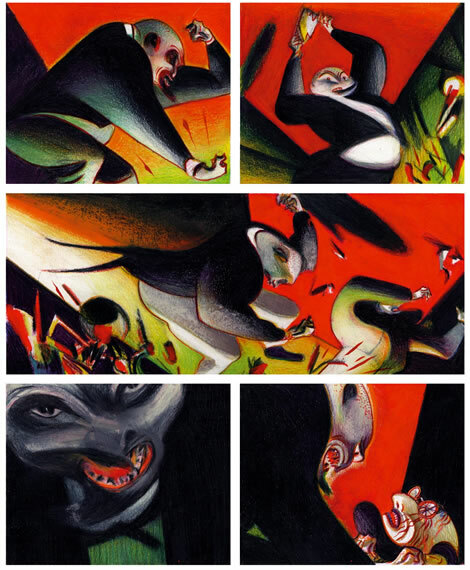 The book became a voyage into Expressionist cuture through to Francis Bacon, so it was natural to use some very wild unusual colours, acid greens and yellows, to give an hysterical idea of reality. I was surprised you used Stevenson’s words. Your version was told so extraordinarily, you barely need the words. We wanted to respect the original text, especially his descriptions of interor states of mind and the atmosphere of the city. We kept the classic language, not modernised. There is a moment at the end of story, when Jekyll closes himself off inside the studio. In a strange text, he speaks about his father and tries to defend himself with images of sweetness, flowers and red fish, memories of his father. We tried to show a sort of melancholy here, because his choice has damned him so that he can no longer enjoy the good things in life. He will never live with this sweetness again. Where did you meet Claudio Piersanti and how did the story Stigmata come about? 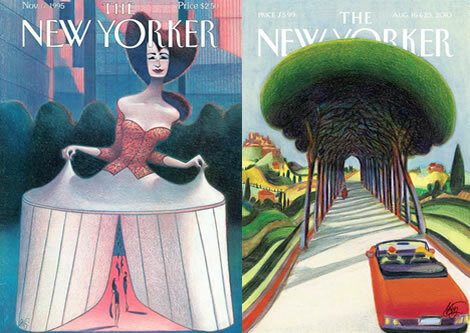 I had read Piersanti’s novels, When he was buying a portfolio of mine, we were introduced. 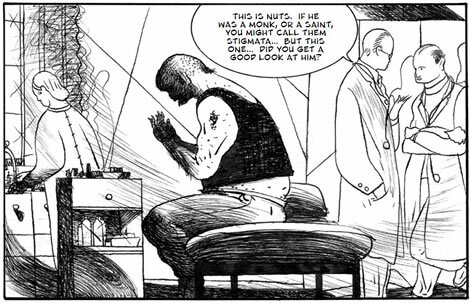 A French publisher wanted a short comic for an anthology about religion, so I asked Claudio because I knew he was interested in philosophy and spiritual problems. 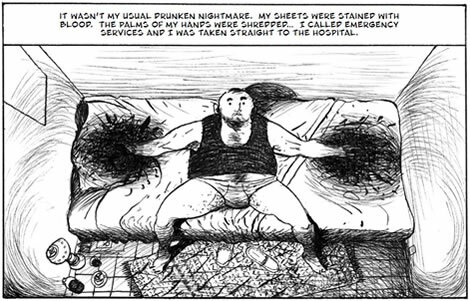 He had the idea of a man who finds he has stigmata wounds on his hands and doesn’t know what to do. 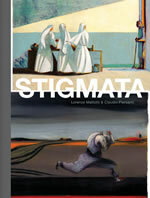 Religion is a big part of Italian culture and stigmata are a powerful metaphor in our life. I liked his idea but wanted the man to be without any culture or religion, a violent drunk. 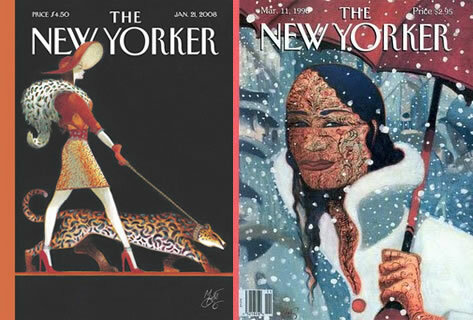 So we made this little metaphoric story in 1998, and in it was all the potential of the graphic novel. We tried developing it into a Pasolini-like film with actors, but I didn’t have a producer, so we decided to make it as a graphic novel. We were always afraid it would be interpreted like a religious story about Catholicism, but we wanted a lighter touch. The way I interpret the situation of this man, the stigmata are a sign that tells him he can do something but he does not want to look at it, because to look at it, he must take responsibillity, he must work. It is a long journey to accept the interior of himself, his normality and to help other people. As the story was wild, very heavy, I used a very wild way to draw. In the same way the character keeps denying this sign and refusing to accept that it means anything, all the drawings look to me like you’ve drawn a face and then scribbled it out, as if you’re determined not to be pretty here! The story is very clear and linear, like a river. I wanted the chance to improvise in the drawing. So in a violent scene, the action is underlined with very violent drawing, which is not shadow but the concretisaton of this violence. It’s pure emotion. The later sequences become like music, a piece of narrative poetry. There is a very strong moment, when the character becomes autistic and crazy in a hospital. A nurse gives him scriptures which he reads in a very ritualistic way, which helps to calm him. To convey this, I wanted to give an idea that metamorphosis in yourself is very physically painful, until you are set free, you open your mind and soul to others. For your latest book, Lou Reed contacted you about his music based on Edgar Allan Poe’s poem The Raven. Yes, it is Poe interpreted by Lou Reed and then reinterpreted by me. Lou Reed is a very sensitive person, a contemporary poet, attentive to everything. He gave me lots of confidence to do what I want, to follow his music, and not stay close to Poe’s writing, not illustration but reinterpretation. He pushed me to extract something hidden inside me. Why are comics going through such a renaissance now? Comics is a really contemporary language. You don’t need so much money, so young people can use it to express themselves.The way it is developing in the graphic novel gave the possibility to touch on different subjects - historical, autobiography, reportage, symbolistic - it’s developing all its potentiality in this moment, I think. In the way that cinema was at one moment the expression of contemporaneity, the capacity of comics is really interesting at this moment. Comics have been on the edge of reaching a critical mass, tipping over into this state that we seem to be in now, for a couple of decades. It needs a combination of things. Twenty years ago it needed, more than anything, writers to create great scripts, compelling stories, and Alan Moore was a great figurehead and many others thought ‘I want to do that as well.’ It needed more than 2 or 3 books on the shelves to create a critical mass and there were only 2 or 3 in 1986 so it has been slowly building. And all these things play a part, even the dozy superhero films. But the thing I really love is, when I started doing talks in art schools twenty years ago, maybe one or two people afterwards would come up and talk to me about comics. Now the whole class does. There’s a generation that don’t care less about Marvel Comics or The Beano, they’re simply looking at the raw nature of the medium and undestanding that it’s a great way of communicating and getting your ideas across, with no preconceptions at all, doing it on the net, it’s a fantastically democratic medium. 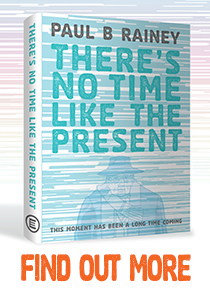 Others may disagree that culture is led from the top down, but the fact that Jonathan Cape, Faber and others are putting together wonderful lines of books, nothing to do with people’s general preconceptions of what comics are, brilliant books, beautifully told, I think this is what finally pushes it over the finishing line and now we have real momentum. In this new century, comics seems to be the perfect artform for self-expression. It’s important to think of comics not like a genre but as text, images, writing, melody, colour, form. If you take it in a pure way, you can make so many things. Little by little, young authors are thinking about it and it is very interesting when artists are able to really use the language of the sign, the form. 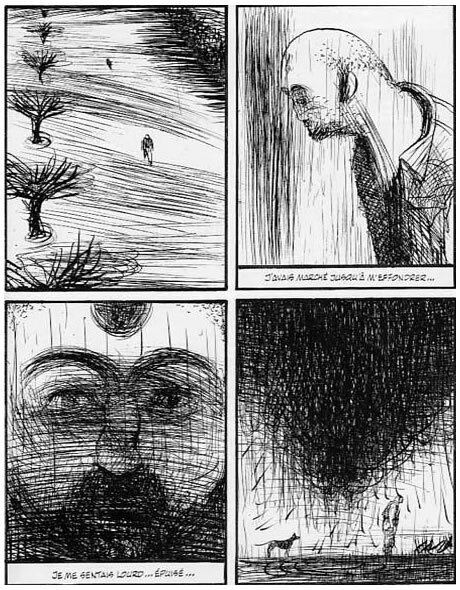 Texts are important and can be great but comics is also the language of images, of styles, of forms. We must use everything to communicate the depth of the subjects and the emotions. This Article originally appeared in Comic Heroes Magazine No. 6.